The way Zencastr works is it will record a separate track for each participant. You simply create an episode, send invite links out to your guests, and hit record. Once you are done recording, you will have a separate high-quality track per guest. For example, if it was you and a guest, then you will have 2 tracks recorded. In order to hear both voices together from each participant's track, the tracks need to be mixed together. Automatic Postproduction will mix the tracks together into a single track and also run some audio enhancements to make it sound great. These enhancements include leveling, noise gating/suppression, and dynamic range compression. You can read more about these enhancements in our blog post on the topic: You Don't Need to be an Audio Engineer to Have a Studio Quality Podcast. 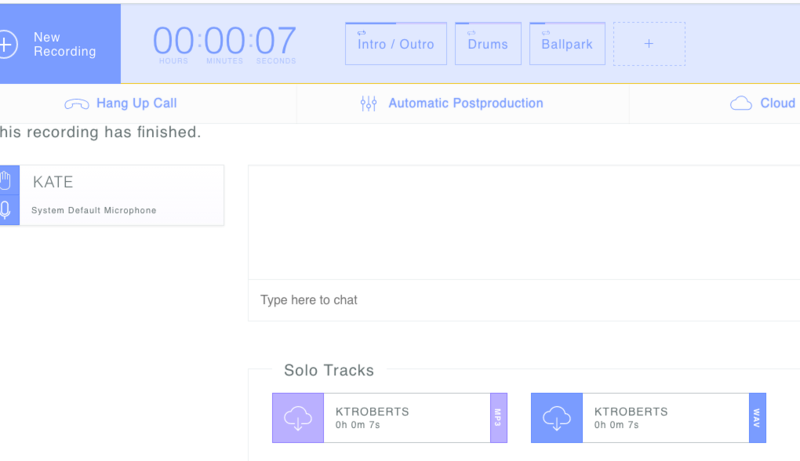 If you would like to use this feature, there is an 'Automatic Postproduction' button that will appear in the toolbar after the tracks have finished uploading. You can select this and choose which tracks you want to combine together into one final mix. Your final mix will then be delivered to your Zencastr recording page and also to your Dropbox where your other tracks are. The postproduction pricing starts at $3 per hour on the Hobbyist (free) plan. It gets cheaper as you buy in bulk. If you use the Professional plan, you get 10 hours a month to use as you need. The postproduction credits you buy roll over each month if they aren't all used however the 10 hours each month that comes with the Pro plan refresh at the beginning of each month.